Dr. K. Sri Dhammananda (born Martin Gamage, 18 March 1919 – 31 August 2006) is a Sri Lankan Buddhist monk and scholar. 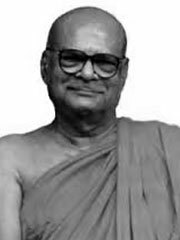 He was ordained as a novice monk (samanera) at the age of 12 and was fully ordained in 1940. His many books are widely read and have contributed greatly to introducing Buddhism to many English-speakers in Southeast Asia and beyond. A trained cardiologist will utilize all available equipment and do numerous tests to pinpoint the exact problem. Now that’s an analogy to differentiate between conventional knowledge and wisdom. Heart attacks are not cardiac infarctions, so therefore book knowledge is not mental development. Buddhism gives full responsibility and dignity to man. It makes man his own master. According to Buddhism, no higher being sits in judgment over his affairs and destiny. That is to say, our life, our society, our world, is what you and I want to make out of it, and not what some other unknown being wants it to be. Above all else, Buddhist education is more about moral and spiritual development. If the coming generation can appreciate this, then Buddhism will have a bright future in this country. If prayer is necessary, it should be to strengthen the mind and not to beg for gains. The following prayer of a well-known poet, teaches us how to pray, Buddhists will regard this as meditation to cultivate the mind.